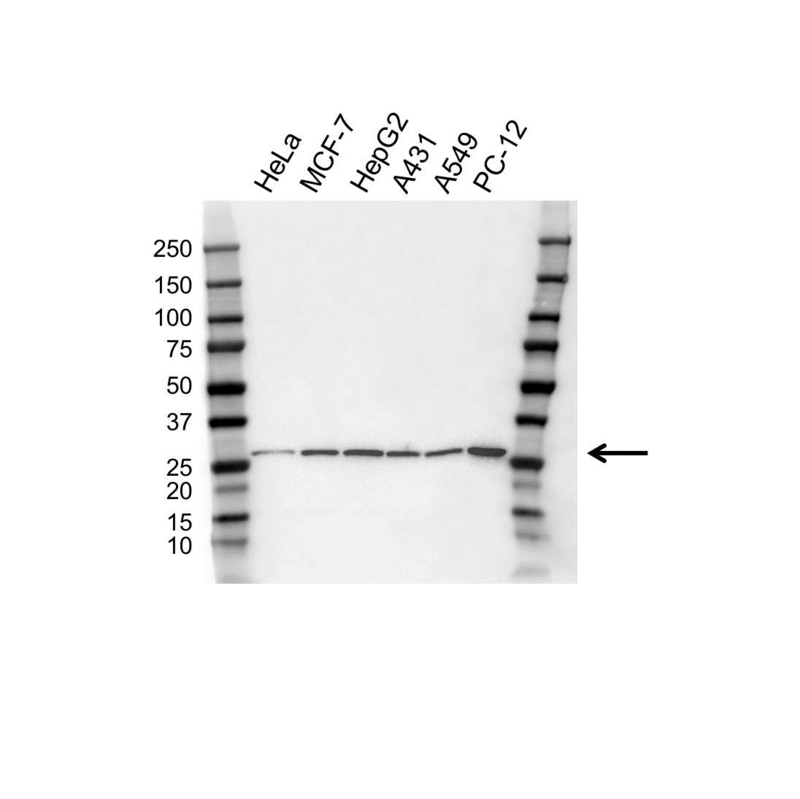 PSMA7 antibody recognizes PSMA7, also known as HSPC, or proteasome subunit alpha 7. Mouse anti Human PSMA7 antibody recognizes PSMA7, also known as HSPC and proteasome subunit alpha 7. The 26S proteasome is a multicatalytic proteinase complex with a highly ordered structure composed of 2 complexes, a 20S core and a 19S regulator. The 20S core is composed of 4 rings of 28 non-identical subunits; 2 rings are composed of 7 alpha subunits and 2 rings are composed of 7 beta subunits. Proteasomes are distributed throughout eukaryotic cells at a high concentration and cleave peptides in an ATP/ubiquitin-dependent process in a non-lysosomal pathway. This gene encodes a member of the peptidase T1A family that functions as a 20S core alpha subunit. The encoded protein interacts with the hepatitis B virus X protein and plays a role in regulating hepatitis C virus internal ribosome entry site (IRES) activity, an activity essential for viral replication. The encoded protein also plays a role in the cellular stress response by regulating hypoxia-inducible factor-1alpha. A pseudogene of this gene is located on the long arm of chromosome 9 (provided by RefSeq, Jul 2012). Mouse anti Human PSMA7 detects a band of 28 kDa. The antibody has been extensively validated for western blotting using whole cell lysates.